Since 1979, every CBS Sunday Morning show ends with a "Moment in Nature." "Sunday Morning" is a news magazine à la "60 minutes." The "Moment In Nature" segment is unique in broadcast television and is beloved by viewers. Because it has absolutely nothing to do with the broadcast that precedes it. It consists of a few minutes of footage of some incredibly beautiful place in the U.S. accompanied by purely ambient audio and natural sounds. So if the "Moment" consists of a bunch of flamingos in Florida, you will probably only hear some wings flapping and the sound of surf. It's as if the producer decided, f*ck it - no matter what is going on in this crazy world - I am going to show you something utterly beautiful and completely non commercial. So in that spirit, these next two blog posts are going to consist of the two letters I think are the most beautiful I have ever read. The first is by Millicent Rogers. 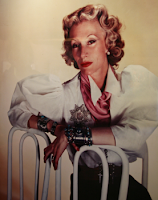 Millicent was a socialite, fashion icon, and art collector. She was the granddaughter of Standard Oil tycoon Henry Huttleston Rogers, and an heiress to his wealth. She came to Taos, New Mexico after a failed love affair with Clark Gable and was an early champion of Native American jewelry and pottery, as well as a collector of 16th century Spanish colonial artifacts. These collections can be viewed in the beautiful museum which bears her name. Did i ever tell you about the feeling I had a little while ago? Suddenly passing Taos Mountain I felt that I was part of the Earth, so that I felt the Sun on my Surface and the rain. I felt the Stars and the growth of the Moon, under me, rivers ran. And against me were the tides. The waters of rain sank into me. And I thought if I stretched out my hands they would be Earth and green would grow from me. And I knew that there was no reason to be lonely that one was everything, and Death was as easy as the rising sun and as calm and natural-that to be enfolded in Earth was not an end but part of oneself, part of every day and night that we lived, so that Being part of the Earth one was never alone. And all the fear went out of me- with a great, good stillness and strength. If anything should happen to me now, ever, just remember all this. I want to be buried in Taos with the wide sky-Life has been marvelous, all the experiences good and bad I have enjoyed, even pain and illness because out of it so many things were discovered. One has so little time to be still, to lie still and look at the Earth and the changing colours and the Forest - and the voices of people and clouds and light on water, smells and sound and music and the taste of wood smoke in the air. Life is absolutely beautiful if one will disassociate oneself from noise and talk and live according to one's inner light. Don't fool yourself more than you can help. Do what you want-do what you want knowingly. Anger is a curtain that people pull down over life so that they can only see through it dimly-missing all the savor, the instincts-the delight-they feel safe only when they can down someone. And if one does that they end by being to many, more than one person, and life is dimmed-blotted and blurred!- I've had a most lovely life to myself- I've enjoyed it as thoroughly as it could be enjoyed. And when my time comes, no one is to feel that I have lost anything of it-or be too sorry-I've been in all of you- and will go on Being. So remember it peacefully - take all the good things that your life put there in your eyes- and they, your family, children, will see through your eyes. My love to all of you."